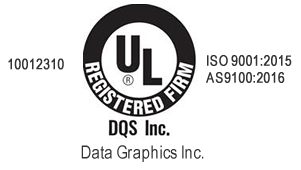 Get a Quote | Data Graphics Inc. Get a Quote | Data Graphics Inc. Deadline looming? Need expedited service? No problem! We love serving customers who are in a hurry. We understand that your product identification labels, overlays or nameplates may be the last piece of the puzzle prior to shipping your product. Just tell us about your printing needs below to get a fast quote. As a supplier to high-tech industries and all branches of the military, we have developed advanced security protocols. We make your security and privacy our top priority. We will never sell, trade or share your personal information. Get a Fast, No-Obligation Quote and Important Printing Answers! How fast can I get my quote? Can my order production get sped up? What do I need to send to you for my quote? How often do you complete orders ahead of schedule?